Gold mining has a very long tradition and unfortunately has done big damage to the environment and people. Contamination of Ecosystems with toxic waste, child labor, worker exploitation, land rights violation and displacement of communities are just some examples. Different organizations and jewellers contribute to address these issues and offer sustainable alternatives. There is “green”, “eco”, “eco-friendly”, “ethical” or “recycled” gold jewelry, some are third party certified (e.g. 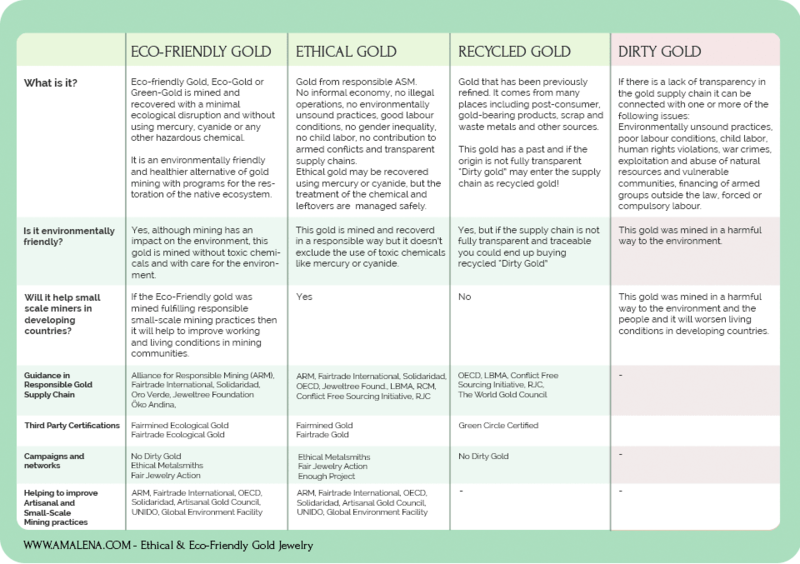 : Fairtrade or Fairmined) and others follow similar guidelines without certification. To shed some light on this topic we made a list what to look out for when buying your next piece of gold jewelry. Ethical gold refers to gold from responsible Artisanal and Small-scale Mining (ASM). Ethical gold comes from mines which work with different kinds of organizations that through programs, developing of initiatives, training and other strategies support the miners and their communities in improving their living conditions and responsible mining practices. Ethical gold may be recovered with the use of mercury or cyanide, but the treatment of the chemical and leftovers are managed safely. Large Scale mining is very destructive to the environment and to the aquatic ecosystems, however, it doesn’t mean that Small-Scale-Mining is more eco-friendly as this sector is the largest mercury pollutant in the world. Cyanide and/or mercury is used in the gold mining process and has harmful effects on human health and the environment. Eco-friendly Gold, Eco-Gold or Green-Gold is mined and recovered with a minimal ecological disruption and WITHOUT using mercury, cyanide or any other hazardous chemical, usually using the gravity method. It is an environmentally friendly and healthier alternative of gold mining with programs for the restoration of the native ecosystem. It is defined as gold that has been previously refined and it comes from many places including post-consumer products, gold-bearing products, scrap and waste metals and other sources. The origin of recycled gold is considered to be the point in the gold supply chain where the gold is delivered to the refiner or recycler. Since refineries often collate gold from multiple sources it has been very difficult to reliably trace the source. “Dirty Gold” (see table above) from conflict-affected and high-risk areas may enter the supply chain as recycled gold, as part of the subcategory described before, in order to hide its origin. As the producers of about 20% of gold worldwide, artisanal and small-scale gold miners (ASM) consume more than 30% of all industrially used mercury. This makes them the planet’s biggest mercury polluter.